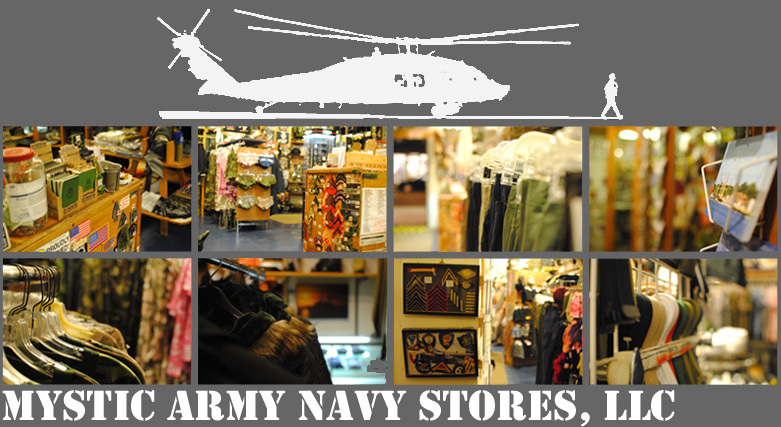 MYSTIC ARMY NAVY STORE LLC is celebrating their 25th Anniversary!!! 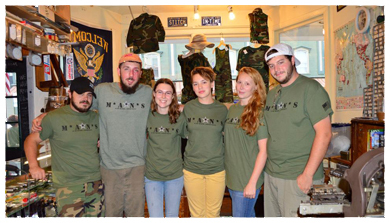 Mystic Army Navy began as a single store in August of 1993 on West Main Street in Mystic. Original owners Larry Gemma and Bert Dahl envisioned bringing a new element to the venerable Downtown Mystic Historic District- a shopping experience for everyone. The store's motto quickly became It's Not just a Store-- It's an Adventure. By 1996 the pair had opened a second store in the Olde Mistick Village, and continued to grow the business, incorporating the new web based reality with an online store in 1998. Michelle Gemma has now taken over as the sole owner and continues to consistently reinvent the stores in the same way her father and Dahl had done for two decades. And now our next chapter begins! 2017 marks the consolidation for expansion for Mystic Army Navy! Our Downtown store at 37 West Main Street has expanded to twice our original size, as the store formerly behind us, "The Rose" moved out, allowing us to take down the wall behind us and expand all the way back to Green Marble Coffee House! Bigger and Better! We have been expanding our product selection for boots, bags, jackets, and many other departments! Come check us out! We may not be the biggest store on the block, but we have been operating online since 1998 and know how to take care of our customers. Your personal information is secure with us and we do not keep credit cards on file, nor will we charge you until a human being (pictured above) has processed your order and prepared it to ship. Thank you to all of our repeat customers over the years. Money-back guarantee return policy (Online sales only) If, at any time within 30 days of purchase you are not satisfied with your merchandise, Mystic Army Navy Stores will refund your purchase, less any postage fees paid, if you return your merchandise unused, with all tags, and mailed back insured to us. Note-This applies to merchandise that Mystic Army Navy Stores LLC has shipped out to customers. No refunds issued for merchandise purchased or picked up in the two stores: Exchange or Store credit only! Please call or email us with any questions.